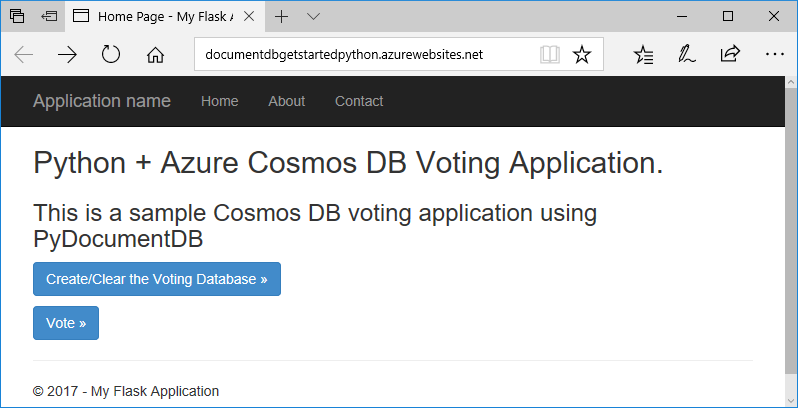 This tutorial shows you how to use Azure Cosmos DB to store and access data from a Python Flask web application hosted on Azure App Service. This tutorial presumes that you have some prior experience using Python and Azure websites. 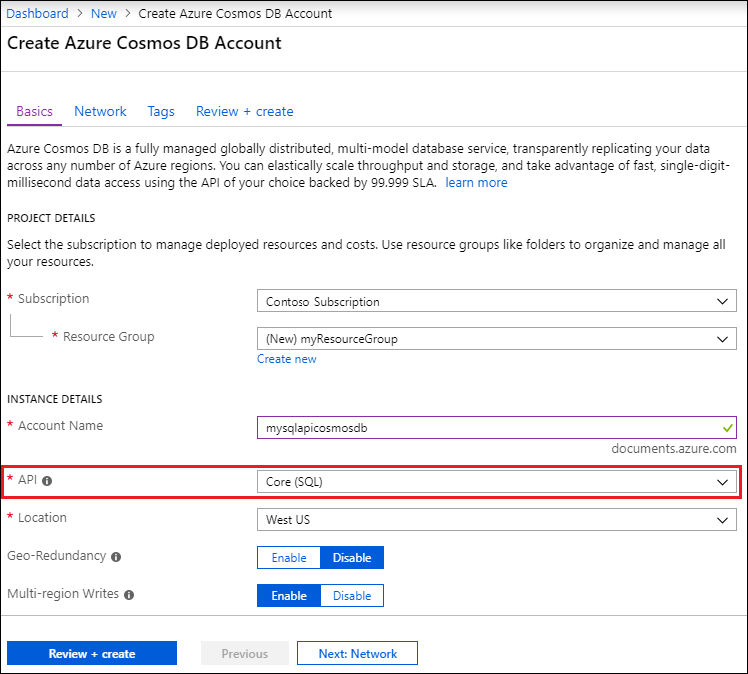 Creating and provisioning an Azure Cosmos DB account. Creating a Python Flask application. 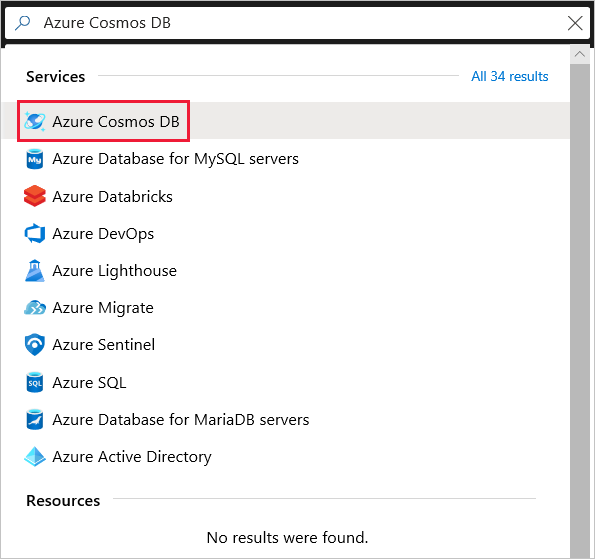 Connecting to and using Azure Cosmos DB from your web application. Deploying the web application to Azure App Service. 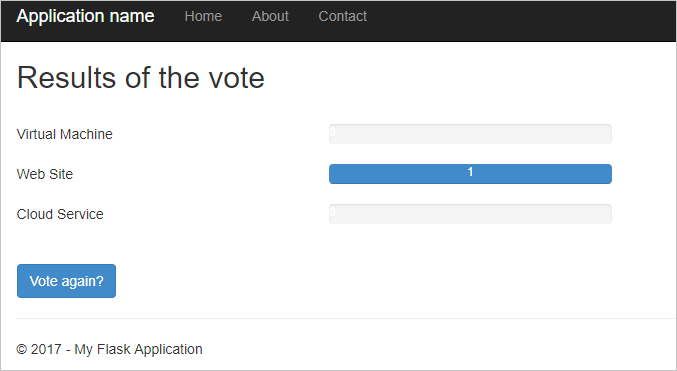 By following this tutorial, you will build a simple voting application that allows you to vote for a poll. Visual Studio 2017 with Azure development and Python development enabled. You can check whether these prerequisites are installed, and install them, by opening Visual Studio Installer locally. Microsoft Azure SDK for Python 2.7. Python 2.7. You can use the 32-bit or 64-bit installation. 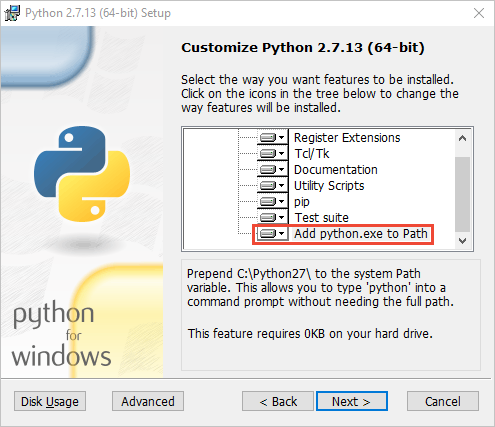 If you are installing Python 2.7 for the first time, ensure that in the Customize Python 2.7.13 screen, you select Add python.exe to Path. Microsoft Visual C++ Compiler for Python 2.7. 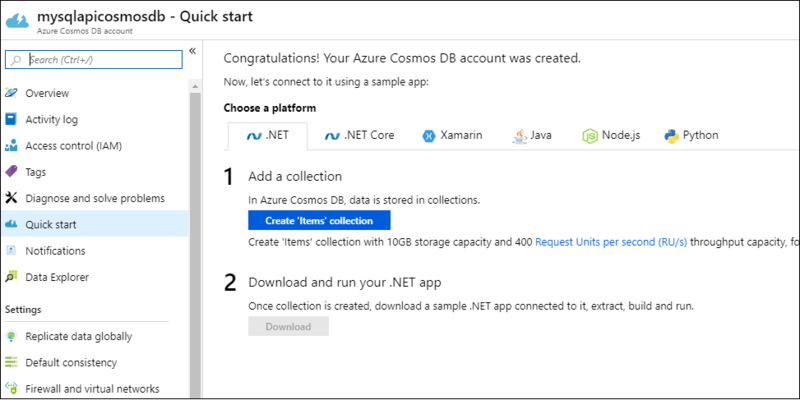 Let's start by creating an Azure Cosmos DB account. 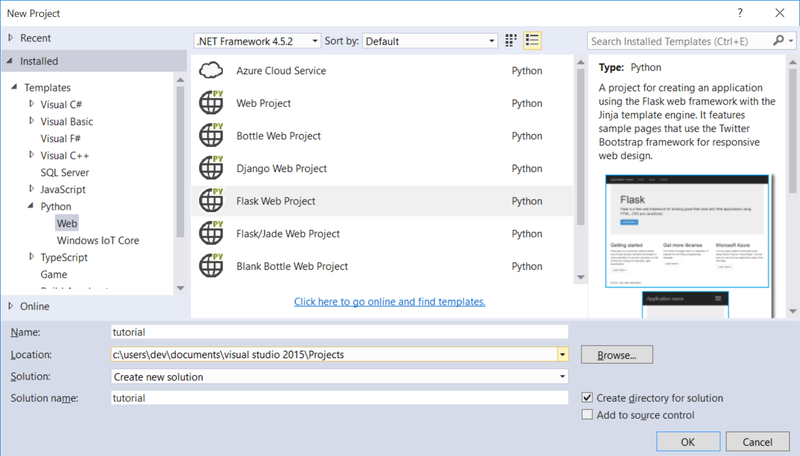 If you already have an account or if you are using the Azure Cosmos DB Emulator for this tutorial, you can skip to Step 2: Create a new Python Flask web application. Now let's walk through how to create a new Python Flask web application from the ground up. In Visual Studio, on the File menu, point to New, and then click Project. In the left pane, expand Templates and then Python, and then click Web. Select Flask Web Project in the center pane, then in the Name box type tutorial, and then click OK. Remember that Python package names should be all lowercase, as described in the Style Guide for Python Code. 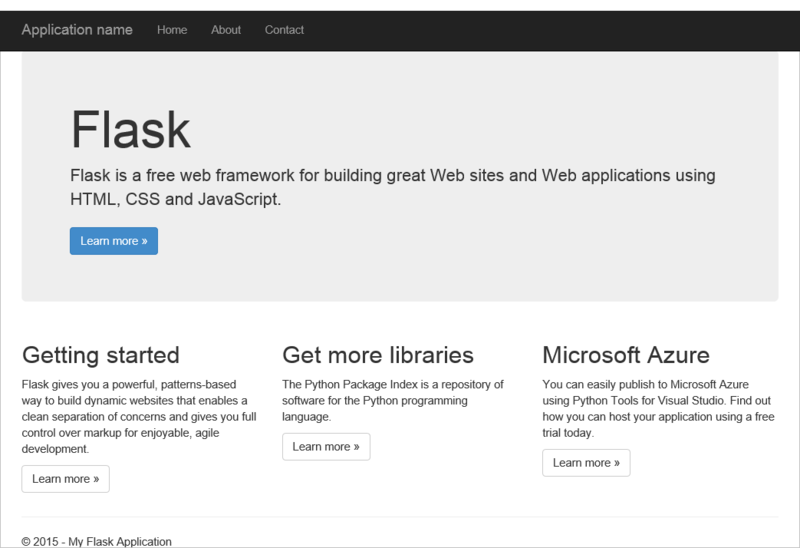 For those new to Python Flask, it is a web application development framework that helps you build web applications in Python faster. 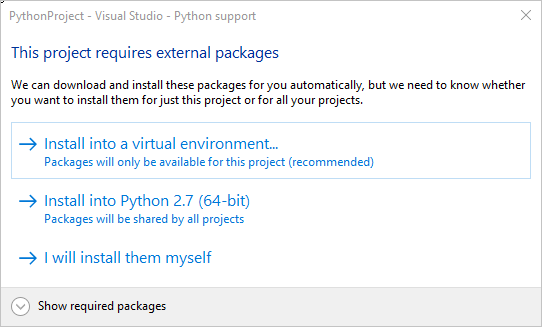 In the Python Tools for Visual Studio window, click Install into a virtual environment. 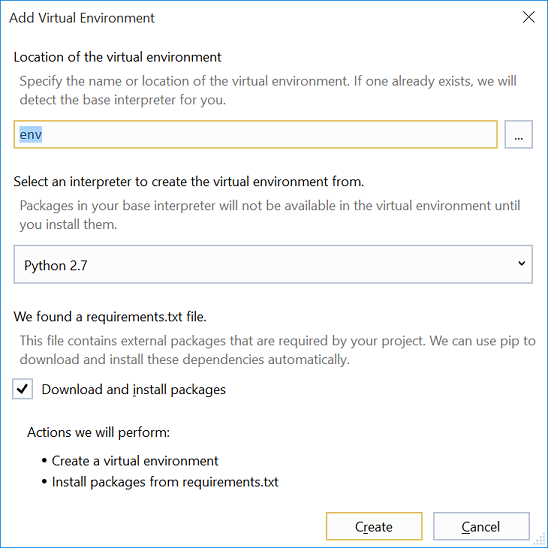 In the Add Virtual Environment window, select Python 2.7 or Python 3.5 in the Select an interpreter box, accept the other defaults, and then click Create. This sets up the required Python virtual environment for your project. The output window displays Successfully installed Flask-0.10.1 Jinja2-2.8 MarkupSafe-0.23 Werkzeug-0.11.5 itsdangerous-0.24 'requirements.txt' was installed successfully. when the environment is successfully installed. 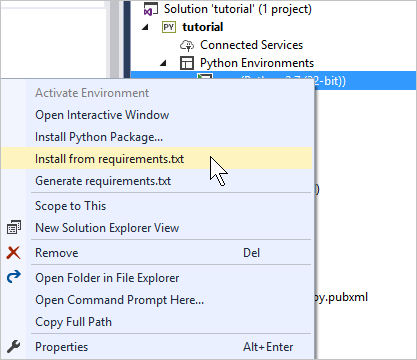 After your project is set up, you'll need to add the required Flask packages to your project, including pydocumentdb, the Python package for the Azure Cosmos DB SQL API. In Solution Explorer, right-click env and click Install from requirements.txt. In rare cases, you might see a failure in the output window. If this happens, check if the error is related to clean up. Sometimes the clean up fails, but the installation will still be successful (scroll up in the output window to verify this). You can check your installation by Verifying the virtual environment. If the installation failed but the verification is successful, it's OK to continue. Let's make sure that everything is installed correctly. Build the solution by pressing Ctrl+Shift+B. Once the build succeeds, start the website by pressing F5. This launches the Flask development server and starts your web browser. You should see the following page. Stop debugging the website by pressing Shift+F5 in Visual Studio. Now let's create your voting application by adding new files and updating others. In Solution Explorer, right-click the tutorial project, click Add, and then click New Item. Select Empty Python File and name the file forms.py. Add the following code to the forms.py file, and then save the file. In Solution Explorer, expand the tutorial folder, and open the views.py file. Add the following import statements to the top of the views.py file, then save the file. These import Azure Cosmos DB's PythonSDK and the Flask packages. Still in views.py, add the following code to the end of the file. This takes care of creating the database used by the form. Do not delete any of the existing code in views.py. Simply append this to the end. Still in views.py, add the following code to the end of the file. This takes care of setting up the form, reading the database, collection, and document. Do not delete any of the existing code in views.py. Simply append this to the end. # Read databases and take first since id should not be duplicated. # Read collections and take first since id should not be duplicated. # Read documents and take first since id should not be duplicated. In Solution Explorer, in the tutorial folder, right-click the templates folder, click Add, and then click New Item. Select HTML Page, and then in the name box type create.html. Repeat steps 1 and 2 to create two additional HTML files: results.html and vote.html. Add the following code to create.html in the <body> element. It displays a message stating that we created a new database, collection, and document. Add the following code to results.html in the <body> element. It displays the results of the poll. Add the following code to vote.html in the <body> element. It displays the poll and accepts the votes. On registering the votes, the control is passed over to views.py where Azure Cosmos DB recognizes the vote cast and appends the document accordingly. In the templates folder, replace the contents of index.html with the following. This serves as the landing page for your application. In Solution Explorer, right-click the tutorial project, click Add, click New Item, select Empty Python File, and then name the file config_cosmos.py. This config file is required by forms in Flask. You can use it to provide a secret key as well. This key is not needed for this tutorial though. Add the following code to config_cosmos.py, you'll need to alter the values of COSMOSDB_HOST and COSMOSDB_KEY in the next step. In the Azure portal, navigate to the Keys page by clicking Browse, Azure Cosmos DB Accounts, double-click the name of the account to use, and then click the Keys button in the Essentials area. On the Keys page, copy the URI value and paste it into the config.py file, as the value for the COSMOSDB_HOST property. Back in the Azure portal, on the Keys page, copy the value of the Primary Key or the Secondary Key, and paste it into the config_cosmos.py file, as the value for the COSMOSDB_KEY property. Once the build succeeds, start the website by pressing F5. You should see the following on your screen. Click Create/Clear the Voting Database to generate the database. Then, click Vote and select your option. For every vote you cast, it increments the appropriate counter. Stop debugging the project by pressing Shift+F5. Now that you have the complete application working correctly against Azure Cosmos DB locally, we're going to create a web.config file, update the files on the server to match the local environment, and then view the completed app on Azure. This procedure is specific to Visual Studio 2017. If you are using a different version of Visual Studio, see Publishing to Azure App Service. In Visual Studio Solution Explorer, right-click the project and select Add > New Item.... In the dialog that appears, selecting the Azure web.config (Fast CGI) template and select OK. This creates a web.config file in your project root. Set the WSGI_HANDLER entry in web.config as to tutorial.app to match your project name. In Visual Studio Solution Explorer, expand the tutorial folder, right-click the static folder, select Add > New Item..., select the "Azure static files web.config" template, and select OK. 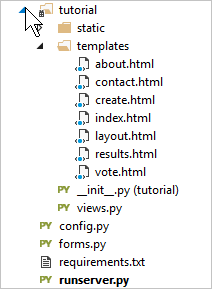 This action creates another web.config in the static folder that disables Python processing for that folder. This configuration sends requests for static files to the default web server rather than using the Python application. Save the files, then right-click the project in Solution Explorer (make sure you're not still running it locally) and select Publish. In the Publish dialog box, select Microsoft Azure App Service, select Create New, and then click Publish. 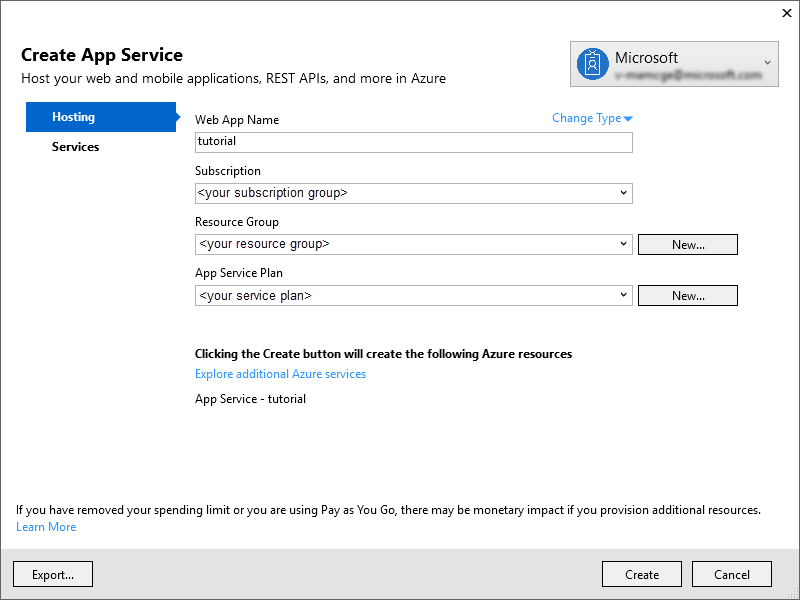 In the Create App Service dialog box, enter the name for your web app along with your Subscription, Resource Group, and App Service Plan, then click Create. In a few seconds, Visual Studio finishes copying your files to the server and displays "The page cannot be displayed because an internal server error has occurred." on the http://<your app service>.azurewebsites.net/ page. In the Azure portal, open your new App Service account, then in the navigation menu, scroll down to the Development Tools section, select Extensions, then click + Add. In the Choose extension page, scroll down to the most recent Python 2.7 installation and select the x86 or x64 bit option, then click OK to accept the legal terms. Restart the App Service in the Azure portal after installing the new packages by pressing the Restart button. If you make any changes to your app's requirements.txt file, be sure to again use the Kudu console to install any packages that are now listed in that file. Once you've fully configured the server environment, refresh the page in the browser and the web app should appear. If the web page does not appear, or you still get the "The page cannot be displayed because an internal server error has occurred." message, open the web.config file in Kudo and add <httpErrors errorMode="Detailed"></httpErrors> to the system.webServer section, then refresh the page. This will provided detailed error output to the browser. If you receive an error on your vote page, and you named your project something other than tutorial, make sure that __init__.py references the correct project name in the line: import tutorial.view. Congratulations! You have completed your first Python web application using Azure Cosmos DB and published it to Azure. To add additional functionality to your web application, review the APIs available in the Azure Cosmos DB Python SDK. For more information about Azure, Visual Studio, and Python, see the Python Developer Center. For additional Python Flask tutorials, see The Flask Mega-Tutorial, Part I: Hello, World!.